I’ve traveled cross-country from Arizona to Indiana and back multiple times over the years and each time the goal is to find a different way to explore. If your travels find you driving through the heart of this country, Powell Gardens or Wichita in Kansas are excellent stops. In Illinois, Allerton Park or the Champaign Prairie Walk are great for stretching your legs. If you take a southern route don’t miss both the Dallas and & Ft. Worth Gardens in Texas, or in Missouri the Botanical Garden in St. Louis. However, I would propose there is no prettier mid-point stop in a drive across the continental US than Lauritzen Gardens in Omaha Nebraska. 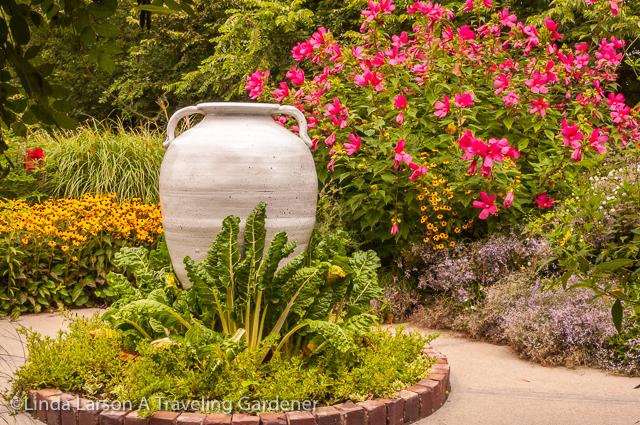 Located along the Missouri River where the soil is rich and fertile, gardeners have worked magic in 20 thematic spaces. 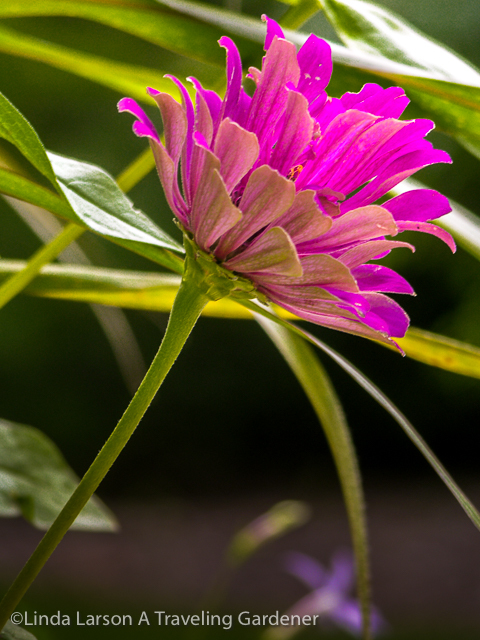 You have 100 acres to explore and every part of your visit connects you to the beauty of nature. 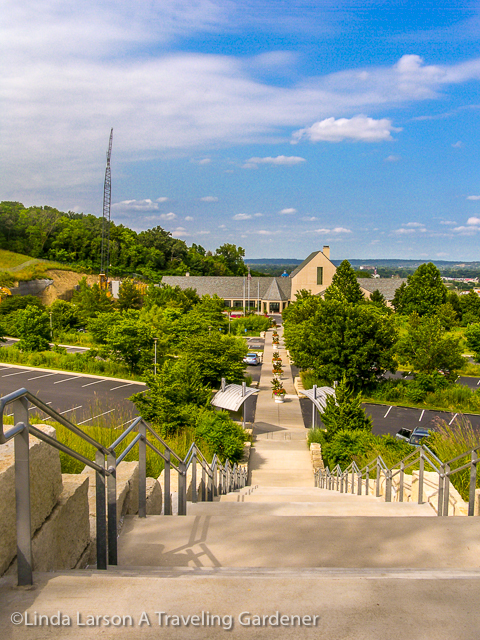 Lauritzen wastes not a step of gardening space beginning with a “Parking Garden” greeting visitors with flowering annuals and perennials among the necessary asphalt space. You enter a spectacular 17,500 Sq. Ft. conservatory where tropical plants, a waterfall, and floral displays provide a stunning garden experience before you go through to the gardens. This is a garden well-loved by its community and a large lawn site designated as The Festival Garden for celebrations and events is near the entry. There is a Rose Garden and a Spring Flowering Walk, a Tree Peony Garden and an extensive Children’s Garden with a maze and butterfly house. “The Song of the Lark Meadow” lets you wander about in a Midwest prairie filled with wildflowers and native grasses. Birds take sanctuary here, nesting, raising their young, resting during migration, and singing their unique songs. 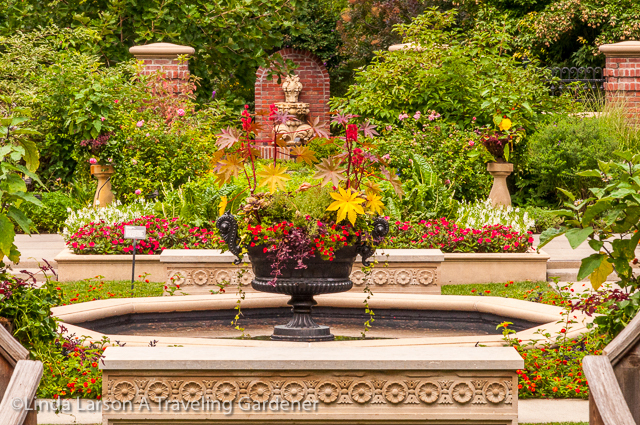 The name of the garden is from Nebraska author Willa Cather’s short story of the same name. Railroads are a big part of the history in this country and driving east on 1-80 you see two enormous locomotives high on the horizon right above the “Welcome to Omaha” sign. 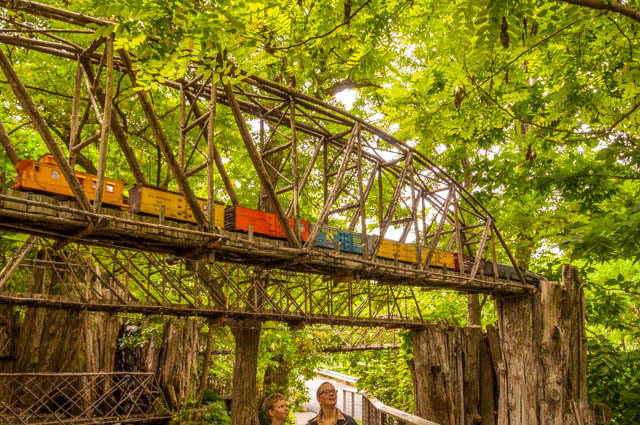 Inside the garden, a Model Railroad Garden chugs along on a hillside with seven model railroads running May to October. These are not train set villages from a box, but miniature landmarks of the surrounding area constructed from natural materials using leaves, bark, pinecones, gourds, twigs, and cinnamon sticks. Finding your way here takes you through a hardwood arboretum and along a waterfall. 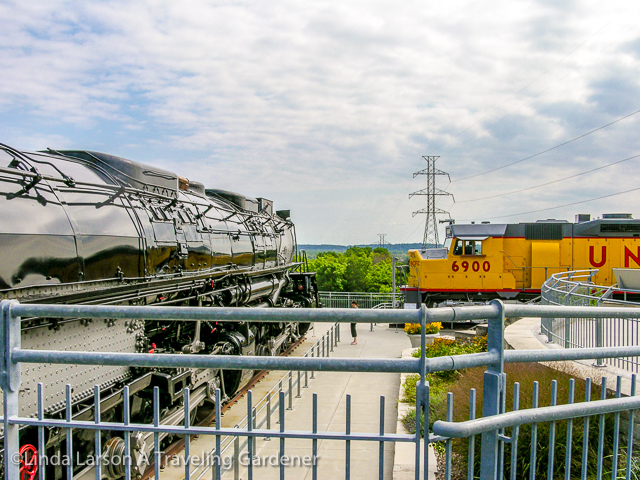 From the Lauritzen Gardens, you can climb a grand, long, steep staircase to Kenefick Park where you will find “Two of the greatest locomotives ever to power Union Pacific Railroad. I love everything about this garden but for me, I loved the long flowering walkway designated as the English Perennial Garden. 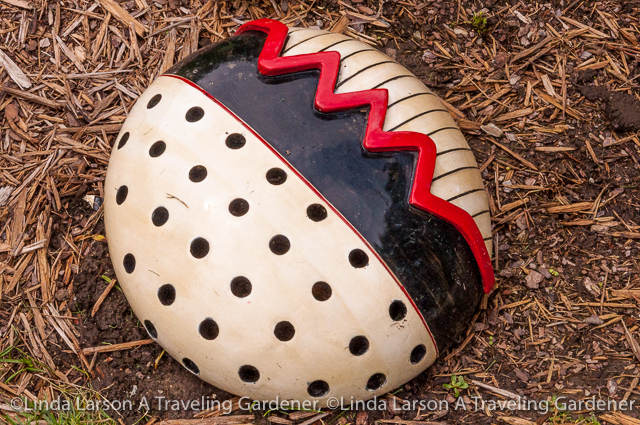 The landscaping is abundant and is accented with colorful ceramic boulders adding an artistic surprise all along the way. 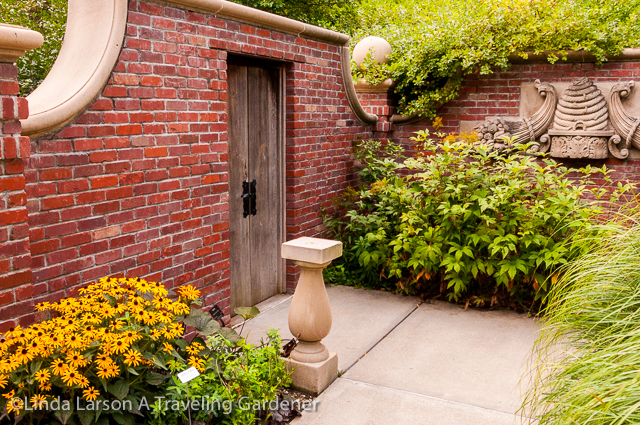 This walkway brings you to the red brick walled Victorian Garden. Once inside, a central formal design recreates the Victorian feel of gardens past. 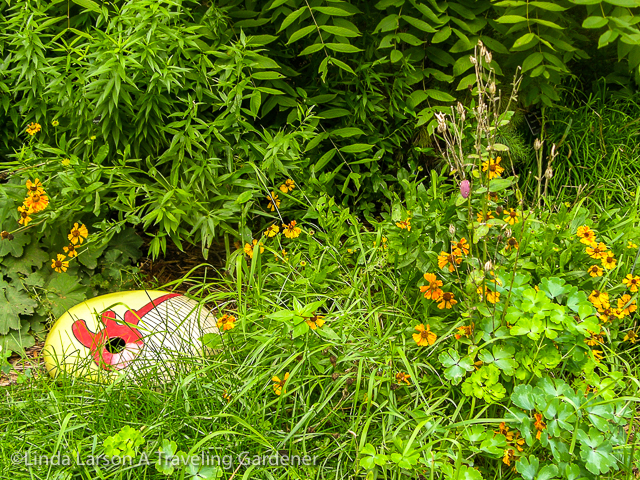 Around the edge are more free flowing perennial plantings softening the walls with color and texture. But it is what is on the walls that made this space so fascinating. 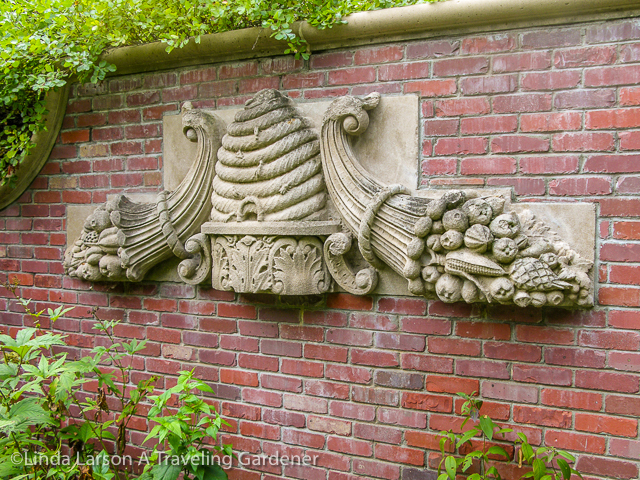 A hand carved limestone bee hive and cornucopia hangs on the wall. This architectural remnant came from a savings and loan building built originally in 1906. The building was razed in 1976 but wise minds preserved this element. Here you can see the detail and beauty of this piece of an unknown craftsman’s work. Other repurposed elements in cast iron and antique urns are showcased here. The entire space envelopes you in nature’s beauty and artful creations from over the years. It feels serene and secreted away from the world. Sculpture and design are seamlessly integrated throughout the garden, shady spaces are planted with hostas, fragrant plantings perfume the air. 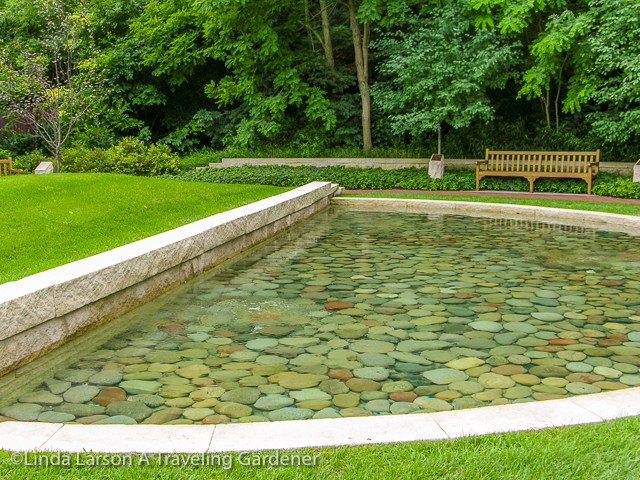 A Garden of Memories used for more intimate celebrations such as anniversaries and memorials is highlighted with a half circle reflecting pool filled with large smooth river stones. Gardens are always a part of my navigating points and Midwest gardens are a delight, reaching their peak during the summer. There is much to appreciate in walking prairie spaces, woodland trails, and bird sanctuaries as you travel under spacious skies and drive from sea to shining sea. Just in time! We are planning a road trip in July that will take us through Omaha. Planned to visit the zoo but will now add a visit to this garden! Amazing. Added to my Garden Bucket List!